When we see clothes hanging in the store or on a scrollable screen, we miss out on the lengthy and involved process to the final product, a road that includes steps such as cutting, dyeing, and sewing fabrics together. Adooka’s baby layette collection is 100% organic and designed, cut, sewn, printed in the USA, and they are proud to show you the process in making these cheery garments. Adooka began as a commitment from two moms to create a company that supports small American businesses, and they have followed through with finding and supporting artisans in their respective fields. Seeing how each item is constructed will give you a whole new appreciation for these beautiful and well-made clothes. The baby layette line features bold floral graphics, tried-and-true stripes, and bright colors all around. Small details such as pockets, contrasting colored edges, arm and leg ruffles, curious eyeballs, and even a friendly dragon peeking out of a pocket add extra fun to already adorable clothing. 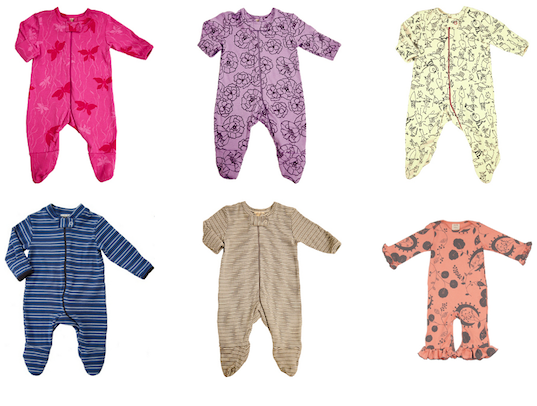 The rompers, onesies, and baby gowns will keep any lucky little one looking cute and comfy. Their shopping site Two Crows for Joy allows you to peruse other like-minded children’s clothing vendors. When we see clothes hanging in the store or on a scrollable screen, we miss out on the lengthy and involved process to the final product, a road that includes steps such as cutting, dyeing, and sewing fabrics together. Adooka�s baby layette collection is 100% organic and designed, cut, sewn, printed in the USA, and they are proud to show you the process�in making these cheery garments. Adooka began as a commitment from two moms to create a company that supports small American businesses, and they have followed through with finding and supporting artisans in their respective fields. Seeing how each item is constructed will give you a whole new appreciation for these beautiful and well-made clothes.